This is the thirteenth in this series of 26 posts, one for each letter of the alphabet, that I am writing during the Blogging from A to Z Challenge, April 2016. You can find all the posts, as they are published throughout the month, by following the A-to-Z April 2016 tag. The most common understanding of “mastery” is having reached a high level of skill or accomplishment. A master painter or electrician, for instance. An expert. Someone who has solid, deep understanding of a subject. Another interpretation of “mastery” is more ongoing. In this sense mastery is a continuous process of development and improvement. Mastery is more an attitude and a habit than a state to be achieved. We don’t become a master, but practice mastery. In the pursuit of mastery we are striving not to become someone who “already knows,” but to be continuously paying attention, learning, and often helping others on the journey along with us. In striving for mastery we move beyond simply accumulating knowledge and repeating skills by rote. We begin to make the thing our own. In any art – dance, painting, music – this means building on what our teachers have conveyed. We develop our own expression and style, while still remaining true to the principles. 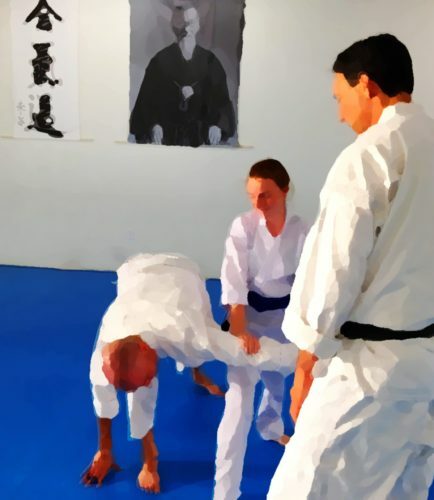 In Aikido this might mean one student’s technique exhibits a soft, flowing grace, while another’s is sharp and authoritative. And both can have integrity. Mastery also means living the art. We don’t stop practicing just because the dojo door clicked shut behind us after class. We try in our daily lives to embody the lessons we learned on the mat. As best we can, we walk the walk. There is no end to this path. We do not achieve the a high rank, frame our certificate, hang up our belt, and say we have arrived. In Aikido, the pursuit of mastery isn’t a way to get to the goal, it is the goal.